This Benefit Report for Year 2017 for knowwhereyourfoodcomesfrom.com, Inc. has been prepared by Frank W. Barrie, the benefit corporation’s President. Pursuant to the benefit corporation’s bylaws, at the annual meeting held on February 1, 2017, the shareholders elected three directors of the benefit corporation: Frank W. Barrie, Albany, NY; Edward Stevens, Loudonville, NY; and Kathryn Sikule, Albany, NY. At the Annual Meeting of the Board of Directors on February 1, 2017, Frank W. Barrie was elected President of the Board and Edward Stevens was elected Secretary of the Board. The voluntary, third-party certification program of Food Alliance is based on these six principles: 1. Protect, conserve and enhance soil, water, wildlife habitat and biodiversity; 2. Conserve energy, reduce and recycle waste; 3. Reduce use of pesticides and other toxic or hazardous materials; 4. Maintain transparent and traceable supply chains; 5. Support safe and fair working conditions; 6. Guarantee food product integrity, with no genetically engineered or artificial ingredients. (54) A news report, Sharing Recipes Using Real Food From Farmers Markets Or CSA Farms to Build Community (12/29/17). (16) Gardening topics including community gardens, home food preservation, container gardening, gardening tips and edible garden design/install. 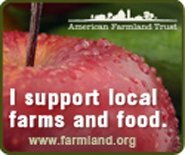 Small ads/logos appearing on the website during 2016 have promoted the following organizations/entities (at no cost to these organizations/entities): (1) Native Seeds, www.nativeseeds.org, (2) Equal Exchange, www.equalexchange.coop, and (3) American Farmland Trust, www.farmland.org. These 3 organizations/entities reflect principles in harmony with the six principles of the Food Alliance certification program delineated above. In 2016, the website also ran the ads/logos for three businesses: Liberty Tabletop, Fruition Seeds and My Pet Chicken. Liberty Tabletop is now the only manufacturer of flatware in the United States, and its concern for the American consumer’s health and safety is reflected in its commitment to only use stainless steel from American steel mills that follow stringent environmental and safety standards, to meet or exceed all federal and state environmental regulations and standards, and to never use harsh or carcinogenic chemicals in its manufacturing process. In the period January 1 through December 31, 2017, traffic to the website, www.knowwhereyourfoodcomesfrom.com remained steady, with a slight increase in the number of page views to 73,017 from the prior year’s 72,538 page views. During 2017, the benefit corporation has maintained an active Facebook page [https://www.facebook.com/knowwhereyourfoodcomesfrom/]. As of the close of the year, the Facebook page has nearly 300 followers, with Facebook posts appearing approximately every week. VI. Compensation paid by the benefit corporation during the year to each director in that capacity?